The purpose of this letter is that I might share with you my impressions of my friend, Mark – when it comes to Godly character and a passion to serve the Lord with a full-hearted commitment and hard work, Mark is the man. Over the years, he has demonstrated a resoluteness to God and a love for His people not only in his own church, but in the years he volunteered at our Joni and Friends’ Family Retreats helping individuals with disabilities. Should you be considering Mark for a role in your church or organization, I would recommend him to you. 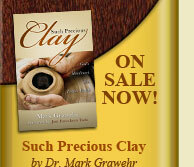 You would not be disappointed in working with Mark Grawehr whether it’s in missions, ministry, or corporate impact. Thank you for considering this specially gifted brother in Christ. I have known Mark Grawehr for the past 11 years. We first met when I was CEO for the Mid Atlantic Conservative Baptist Association. I was called to present our region’s expertise to help the church in West Milford, NJ where he was part of the leadership. I have also had the privilege of staying in his home where I met his dear wife, Becky, and their two girls. In fact, I have recently stayed there a couple of times in the past two months. I mention all this to say I have had an opportunity to get to know him on a professional level as well as a personal one and can highly recommend them as a dear couple doing an exceptional job parenting and home schooling their girls. Mark has just finished an inspiring book, Such Precious Clay, that will be published this fall about his first marriage to Debbie. Mark is an unusually gifted leader. First, seen in the business world where he formed a very successful engineering and construction corporation which he has now sold, also in my many meetings with the leadership team at his church he utilizes his excellent mind to make significant contributions to discussions. He also is a hard worker in finishing tasks assigned to him. I also had the privilege of being on his ordination council. He did an outstanding job in his explanation of the various theological questions and is now ordained by Grace Fellowship Church of West Milford, NJ. I can highly recommend him to any church or Christian organization as a man of impeccable integrity and leadership qualities that will be a blessing wherever he is called to serve.